Starfish are powerful hunters and primarily feed on mollusks. Their main sources of food are clams, oysters sand dollars and mussels. They also eat snails and injured fish, when they can find them. Not all starfish hunt for meat. Some species find decomposing plants and animals in the water or on the beach and consume them, making for much easier prey but lower nutritional value and increased competition from birds. Other starfish hunt in the water, catching sponges, plankton and even coral for their dinner. ​Various starfish exhibit different developmental patterns, most follow the same general theme. After the gametes fertilize each other, they quickly become bilaterally symmetrical larvae, called bipinnaria. These creatures feed on smaller planktonic organisms and float about for a few days or weeks before transforming into non-feeding, larvae called brachiolaria, which settle on the ocean floor. Once the brachiolaria settle in an appropriate habitat, they develop radial symmetry and begin metamorphosing into adults. There is some evidence to suggest that the larvae seek out areas with adult pheromones, which may signal to the larvae that the habitat is suitable. After assuming their characteristic shape, the starfish begin growing to attain adult size. Starfish are found in most of temperate and tropical oceans of the world. Starfish are found in a variety of habitats from the intertidal zone down to the bottom of deep seas but they are most commonly found in shallow marine environments. You can get heart cancer, but it is extremely rare because heart cells stop dividing. It is possible to die of a broken heart, it is called broken heart syndrome and is a result of a high stress situation. During this project we looked at the domestication of animals, mostly dogs. We also looked at mendelian genetics and how traits are past down from parents to offspring. For this project I decided to look at if better image quality of animals raised adoption rates at the La Plata County Humane Society. I chose this project because of my passion for photography. I also thought it would be really fun and exciting to go hang out with dogs and take pictures. Since this project was much easier than most of the other students I wanted to make it a long term project that. Unless the data came back that hypothesis was inaccurate. After trying several times over a couple of months to get in touch with the humane society it became apparent that I was not going to have even a start on this project before it was time to present to the community about what I was going to do. 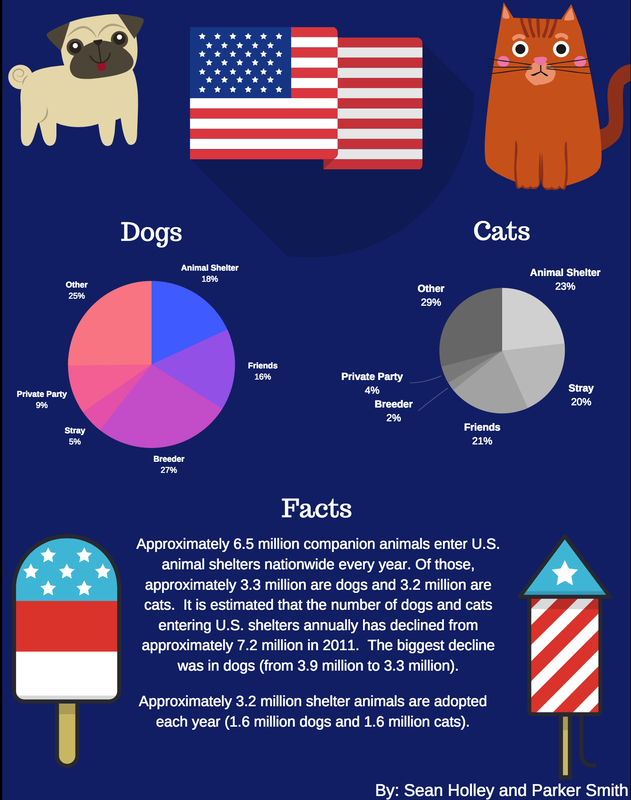 So I looked at pet adoption data in the United States. I focused on where people got there pets from and was shocked to find out how much adoption rates have risen in last couple years. I am hoping that the humane society eventually gets back into touch with me so that I can actually test my hypothesis and make my own data instead of looking at data provided by the government for the whole United States.